A release of 4,500 litres of light fuel oil occurred from a fracture in a fuel line inside a plant room. The loss impacted the plant room and adjoining physiotherapy room, resulting in forced closure of the department. Verde provided the initial emergency remediation response to enable the continued operation of the emergency department without direct impact to building section or to internal air quality. 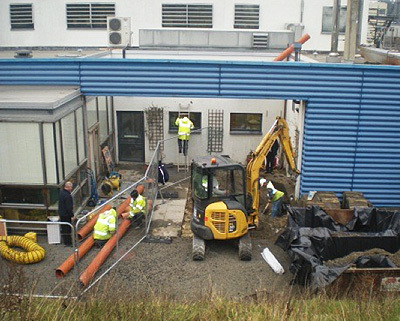 Comprehensive site investigations were then conducted followed by a phased, unobtrusive remediation programme to facilitate the immediate reinstatement of the physiotherapy department. A section of the physiotherapy department was isolated and a negative displacement vapour extraction system was installed to reduce hydrocarbon vapours internally. Emergency response works were conducted to include the breaking out of concrete hardstanding and internal floor areas, the excavation of contaminated material and structural works to remove impacted masonry. Hydrocarbon contaminated water was controlled by recovery to a product recovery system. Phase I & II site investigations were undertaken to assess impact to buildings and environment, with monitoring well installations carried out to facilitate ongoing monitoring of groundwater quality. A Soil Vapour Extraction system, combined with an injection network, was installed below ground prior to reinstatement to allow for the immediate reinstatement of the physiotherapy department whilst facilitate the ongoing remediation of residual contamination beneath the building.